The S.S. Bulli was one of the sailing ships that had a regular service from Sydney to the Illawarra. It carried general freight and passengers and was the main form of transport before the rail service was introduced. The first road to the Illawarra came from Campbelltown, through Appin. The road branched, one heading for Bulli, the other through Darkes Forrest, down Mount Mitchell to Stanwell Park and along the coast to Wollongong. Even after the construction of the Illawarra Road in 1850, most people continued to use the western approach to Wollongong. 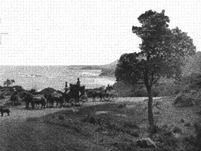 The illustration shows the Coast road looking toward Wollongong from Stanwell Park. Prior to the construction of the railway, stagecoaches serviced the small villages linked by the road. The development of the Helensburgh colliery in 1882, deep in the Bolgo valley, drove the development of the Helensburgh village on the plateau beside the valley. The mine originally consisted of a shaft with winding gear to carry two skips of coal at a time, with a rail spur line to the newly developed Illawarra railway line. The coal is regarded as the best steaming coal in the country. The original Helensburgh railway station in 1914. The new station was moved some three hundred yards because the deviation bypassed the two tunnels that existed at both ends of the original station. The original Helensburgh railway no longer exists although the railway cottages behind have been beautifully restored. Part of the station exists as does the tunnel. Original track has been reinstalled and the site cleared by the Helensburgh Landcare Group. The sign seen in this early photograph was actually discovered in the gully across the road. It too has been restored and placed back on the remaining station. The plan was to develop the township on the plateau above the mine. This shot, taken from the entrance to the mine manager’s home, shows the first Post Office, by this time a private home. A shop remained till the 1970s, now only the school functions at what was the second town centre. The Helensburgh mine, the Metropolitan (“Metrop”), was the life-blood of the local community. This photo from 1908 shows the mine in the days before the slag heaps had begun to fill the valley. Today the coal is transported by truck rather than rail. Steps and a pathway led up the valley from the mine to the plateau above the mine to Parkes Street. The miners then walked to old (Struggle Town), or central Helensburgh. This group of miners are standing at the head of pathway, having walked up from the mine. This photograph from 1908 is taken from the corner of the Centennial hotel and looks across to Walker Street. It shows the main part of the town, or more rightly, village. All the buildings were timber at this time. The only brick building being the court house. The second brick building in town was the Catholic presbytery built in 1914. It is now a private home. Harper’s General Store operated on Parkes Street opposite the Court House. It was later a hardware store before it was demolished after the Second World War. The Anglican Church was built in 1892 and the “School Hall”, the building on the left, some years later. George Ricketts, the local builder, was responsible for both buildings. In the early days the congregations were quite large, with three services each Sunday, but as the years passed the numbers declined. Both the First and Second World Wars seemed to produce a loss of faith in the heart’s of many. The minister originally serviced the churches at Sutherland, Heathcote and Waterfall. Later only Waterfall and Stanwell Park. By the 1960s the church was down to a congregation of a dozen and there was no permanent minister. In the late 1970s the congregation again picked up as young couples moved into the ‘Burgh. The original church building had to be demolished as it became unsafe having been eaten out by white ants. The hall still stands. Empire Day parades were a regular feature of town life up till the First World War. The parade through the town would be followed by a bonfire and fireworks. This parade is coming up Parkes St through the cutting. In the distance is the pine tree growing outside the Anglican Church (or the English Church as it was known then, later the Church of England). The building in the foreground belonged to the local photographer. This view across Walker Street is taken from beside the Workmen’s club and looks across to the Paragon hotel. This hotel closed its doors early in the century as most of the patrons went to the Workers club for discounted beer. Only the Centennial continued as a hotel. The Paragon was turned into a hall and used for community functions till it was destroyed by fire. A brick home was built of the foundations and still has the old cellars underneath. The miners got into a fight with the local publicans and so they decided to start their own club where they could, as it were, serve themselves with a beer after a hard day in the mine. The club not only provided a drink after work, it also catered for their sporting and social needs. The club was one of the earliest clubs of its kind in Australia and still operates as the social centre for the Helensburgh township. Originally it was called the Helensburgh and Lilyvale Workmen’s Club. Lilyvale was once a heavily populated part of the district with its own shops and hotel. The bush has reclaimed the area as it lies within the National Park. The railway station was removed in the 1980s. The Helensburgh Brass Band was formed late in the nineteenth century. Securing land from the mine below the public school, a band hall was built in 1915 and enlarged in 1924. Mr. Morgan was the builder. The week before the official opening on Thursday July 24, the band played for the turning on of electric lighting in the town. They played outside the post office. Electricity for the town was provided by the Metropolitan Mine power house which had been enlarged to power the town as well as the mine. This Helensburgh orchestra in 1911 was quite something. It was strong on brass, as is usual in a mining town. The damaged fingers of the miners are able to handle little else. The girl in white in the centre front is Miss Edmonson, later Kinnell. She served as the organist in the Anglican church through to the early 1950s. The original Stanwell Park railway station was situated in the middle of Stanwell Park, an easy walk to the beach. At the turn of the century there was one shop seen to the left of the station. To the right and out of the picture, there was a gate-keepers cottage which still exists today. In the background Hillcrest can be seen. This was the home of Laurence Hargraves, Australia’s pioneer aviator. The line is now the main road through the Park, while the railway line is up on the side of the hill to the right. This was to overcome the steep incline on the original line that had trains constantly stalling in the Otford tunnel. The school photo of the 1917 Stanwell Park Public School with the first teacher Mr. Surtees. In the early years the shool was held in the Stanwell Park Anglican Mission Church, later named St.George’s. The buidling provided two classrooms during the week and converted to a church on Sunday. The photo shows the side of the church with supportive wings to withstand the Southerly busters. The building is still used as a hall for the Anglican church. This later photograph of the mine, taken around the 1940s, shows the mine nestled in the valley, with leveled slag now filling the valley below the drift entrance. The endless rope was replaced by a conveyer belt which transports the coal to the surface for washing (separating the slag from the coal – the coal floats) and then transportation by truck. The method of extraction is now by long-wall mining, a highly efficient method of extraction. Selby’s Service Station, later the Burgh Ampol, serviced Helensburgh and the passing traffic on the Princes Highway. The building was nothing more than a fibro sheeted shed with an attached cottage. Full service and repairs were carried out in the service department, and it carried an amazing range of spares. The writer even found parts for his 1923 Rugby in the vintage parts department. The building was later bricked over and was even an agency for Roots Group motor vehicles in the 1940s. Today it still operates, although with the building of the expressway, only limited traffic uses the old Princes Highway. Most of the locals now tend to use the Shell service station in town. The Empire picture theatre was one of the more substantial buildings in town, brick front, iron roof and fibro clad walls. It was built in the 1920s for the projection of movie films. It was also used for children’s concerts and live productions. With the advent of TV it declined in use and was turned into a supermarket. It was destroyed by fire and replaced by a modern shopping mall. The first Helensburgh War Memorial was situated in the grounds of the Court House and Police Station. It was set up after the First World War and consisted of a field gun captured from the Turks by the Australian Light Horse in Palestine. The memorial remained until the local police sergeant had the Army remove the gun without consulting the local community. There was a flurry of communications over the “theft” of Helensburgh’s War Memorial, but as the gun was quite rare the Army would not return it. A new Memorial is now in the Park adjacent to the Police Station. Memorial boards of those who served and died in the First World War are held by the Uniting Church and the Anglican Church. The town would still appreciate the return of their War Memorial. The Stanwell Tops Pleasure Grounds were the brain child of Henry Halloran. The grounds were developed for tourist purposes, providing walks, weekend stays, dancing, swimming. The views over Stanwell Park and the ocean are quite spectacular. Although most of the grounds are now part of a residential subdivision, the mineral pool still exists, and many of the lookouts remain. The shopping centre in Walker Street looking from the junction of Parkes Street. Helensburgh was a sleepy little town in those days. Most shops closed for lunch and the bank was open only two days a week. Mind you, today we have no bank! By the 1950s the Helensburgh Miners Band began to fade away. The Band Hall was then used for youth activities. The walls were originally filled with dried seaweed to cut down the noise during band practice and this was quite useful now that rock bands hit the stage. In 2000 the Band Hall burnt down. It was a sad loss to the town.